This is a rare opportunity to own a superbly preserved world cruising yacht, the Island Packet 44. I had the privilege of helping her current owners find the boat two years ago. Ironically, it was the first boat we looked at. Though we looked at many others up and down the east coast of the US, we kept coming back to this boat. The more yachts we scrutinized, the more we knew this was the boat to buy. Now you have that same chance. 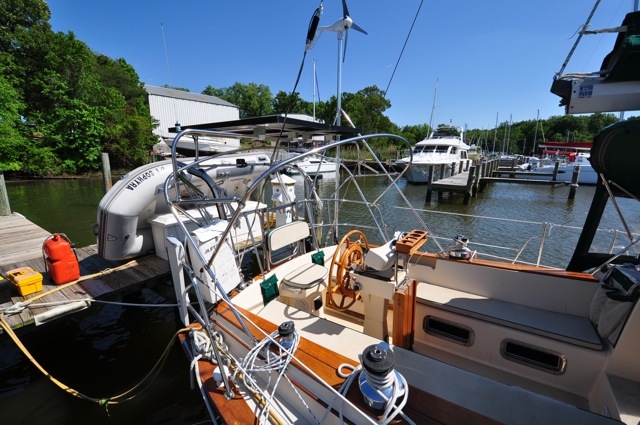 This particular boat has been only lightly cruised on the Chesapeake Bay for years, even though she is completely outfitted for round-the-world voyaging. Step aboard and the level of care she has enjoyed will be obvious. "Sophyra" has enjoyed substantial upgrades during the 2009-2011 time frame. is a beautiful Island Packet 44. She is the one you want to buy! She is lightly used in perfect condition. 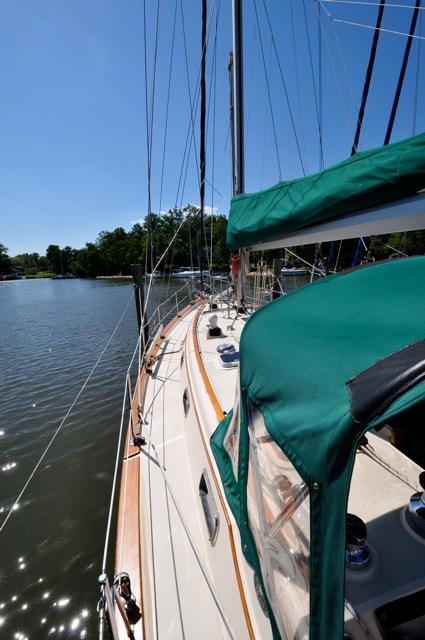 Over the past three years her owners have upgraded the vessel with new sails, new running rigging, new air conditioning system, new Garmin GPS plotter, new wind generation, and new solar panels. About the only thing I can think of that you might add to this totally tricked out yacht would be a watermaker. That will be easy as the plumbing and wiring for one is already in place! In 1990 Island packet conceived a truly world capable long range cruiser, the IP44, what would be their flagship model for several years. Classic in her lines, yet modern, versatile, and very quick, she's the perfect boat for short or long term time aboard, both above and below decks. Bob Johnson, owner of IP and designer of this yacht, has a passion for yacht design and boat building that has fueled the company through more than 30 models. Island Packet's success is built on a the commitment to build a quality boat that meets the needs and expectations of her owners. While the vessels have evolved with new layouts and new creature features, often with lots of input from current IP owners, you can see through new models for sale today the heritage that comes from this model, so popular through the 1990's. These vessels age very well and they hold their value better than many other brands on the market today. This yacht has evolved over the years into their current model, the IP460, a yacht that, similarly equipped, will set you back about $750,000. What makes them so ideal? This yacht is incredibly solidly constructed, a feature you'll notice before you're even out of the slip and sailing. She's so easy and safe to sail -- nearly everything is controllable from the cockpit. 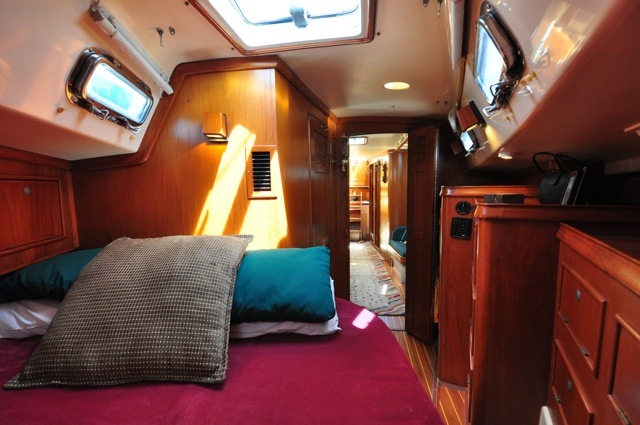 Her cockpit is huge, great for safety in big waves off shore, accommodating for crew and several guests AND plenty of length for those lazy sailing days when you just want to unwind and take a nap while your companions run the boat. Her decks are wide and easy to transit as you head forward. Throughout their large and versatile line of yachts, IP44 continues the traditions of top quality construction, top-of-the-line gear and systems, plenty of room all the tasks and projects you may want to enjoy while aboard. The main salon is spacious and versatile, with L-shaped seating to starboard & twin lounge seats to port. The flip down salon table gives you so much room when you need the space while entertaining. Her galley is second to none in her size range and ideal for gourmet meal preparation. Her nav station, nowadays nearly a thing of the past, is huge and makes a great home office space as well as having plenty of room for real charts and plenty of electronics. She has two full sized staterooms, each with a head. The aft head doubles as a day head. 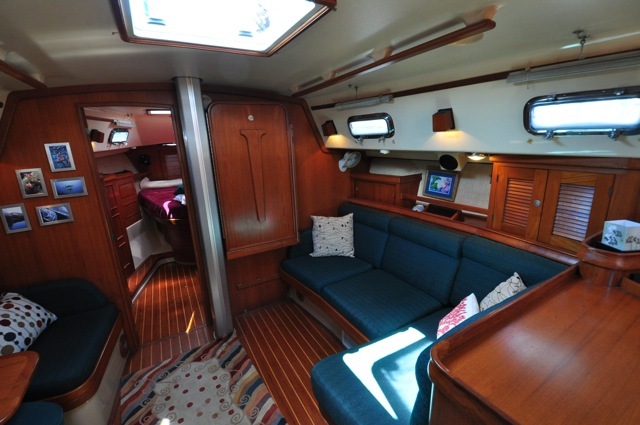 There's tons of natural light via numerous deck hatches and opening ports (everything opens). 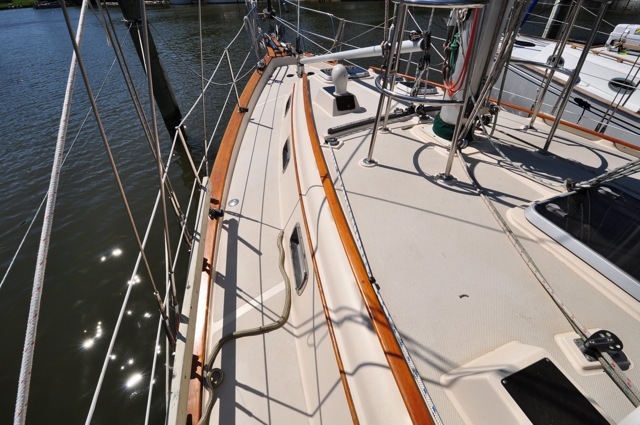 Below the waterline, IP has remained true to the design features necessary for a cruising sailboat including their full keel solid hand laid construction, integral encapsulated keel ballast, protected prop and rudder, true cutter rig for easy sail handling, high bulwarks, and a safe anchoring platform. 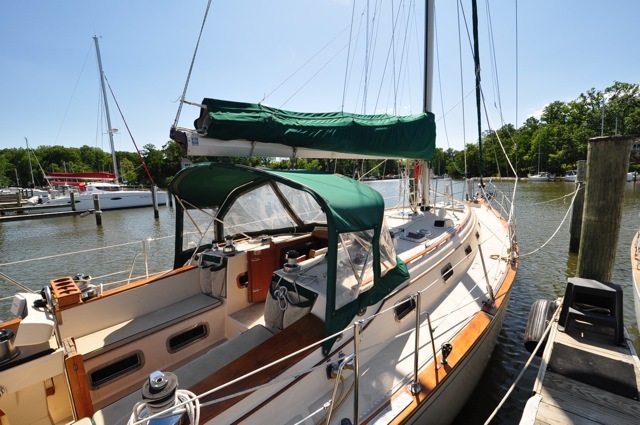 We'll attempt through this listing, to acquaint you with this awesome yacht and all of her treats. We've taken over 200 photos of her that we can email to you with short notice. 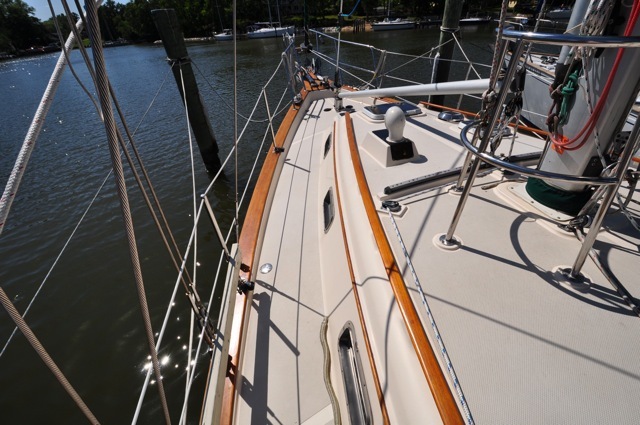 Take a virtual tour of this boat and then give us a shout for a private showing in person. You won't be disappointed! The radar/chart plotter is in the wrong place. I'd update to a new plotter/radar screen at the helm. It's a fine unit though but it just needs to be relocated. 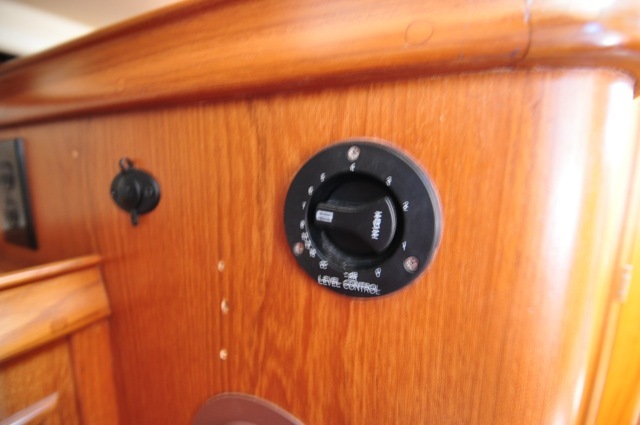 In my history of selling over 200 yachts, I'm just amazed that the decks are so dry -- yet another testament to the build quality of Island Packet Yachts. I remind you however, you'll need to have your own surveyor perform his own examination to confirm my findings. Cabinetery in excellent condition. Interior upholstery in pristine condition. The cabin sole is in great shape. Entire exterior is in superb condition. Dodger and bimini are all less than 3 years old. Exterior teak is beautiful. Needs some minor refinishing at the helm seat and around the companionway hatch. Needs some minor updating. Update radar/chart at the helm and you're set to go. SSB, VHF, EPIRB, other gear all good. Engine appears to be in excellent shape. Well serviced. Hoses and wiring all look good. Excellent condition. Stove/oven is clean. Icebox is super well insulated and huge. Rig is turn-key and sail inventory is plentiful. Sails are new in 2009. Classic IP lines, powerful rig, huge cockpit, easy movement around the decks, well placed top quality rigging, lots of opening ports. You'll see that this is obviously a passagemaking yacht before you even step aboard. Boarding is through gates on either side right near the front of the cockpit. The cockpit is almost 8' long with plenty of room for lots of crew or lounging topsides. All lines come aft for sail handling, furling, hoisting, trimming. 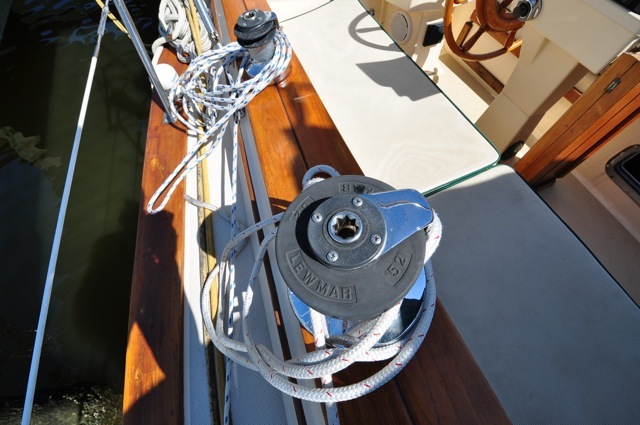 An electric halyard winch allows you to do everything, from hoisting the main, to hoisting the dinghy/outboard, to furling headsails in a big wind, to pulling guests from the water! If you haven't had one on your previous yachts, you'll intstantly fall in love with it and what it does to make your life aboard simpler. 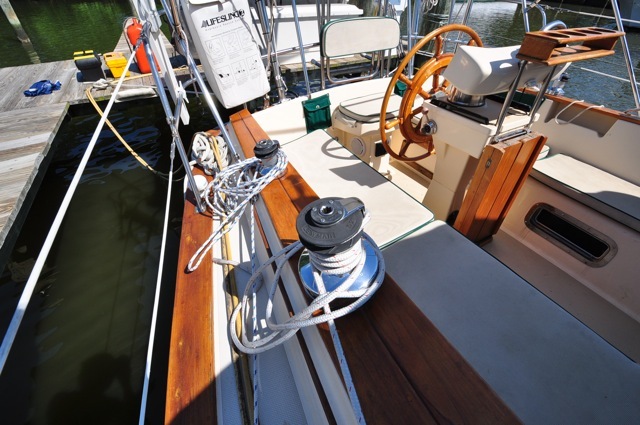 Broad side decks take you forward to the mast and foredeck. More winches on the mast facilitate hoisting the jib and staysail onto the furlers. Lines are smartly run around the boat out of the way for easy passage around the boat in rough seas. Every hatch and port opens to bring light and air into the boat. All are top quality aluminum (hatches) and chromed bronze (ports) for serious off shore work. When it comes to accommodations, Island Packet is famous for space, headroom, and storage! It could be the foremost reason that people love their Island Packets. For living aboard and cruising in your home, it doesn't get better! The IP44 was designed to be the most luxurious of all the IPs up until the 90s. There are two large double staterooms and two large bathrooms with showers, and a huge galley and spacious salon. 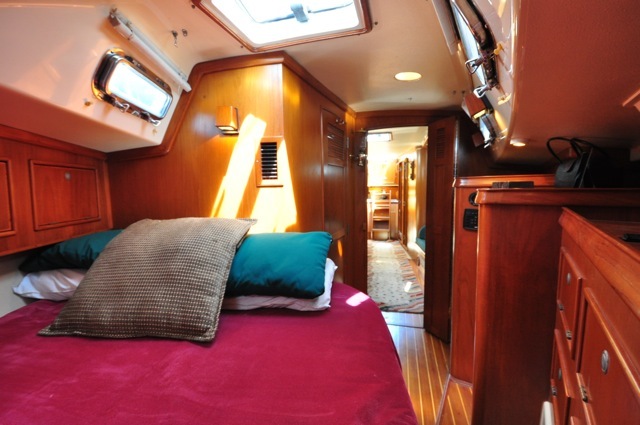 There is plenty of room for a couple to have guests or family aboard for extended periods in absolute comfort. The overall ambiance is one of space, light, and ventillation. 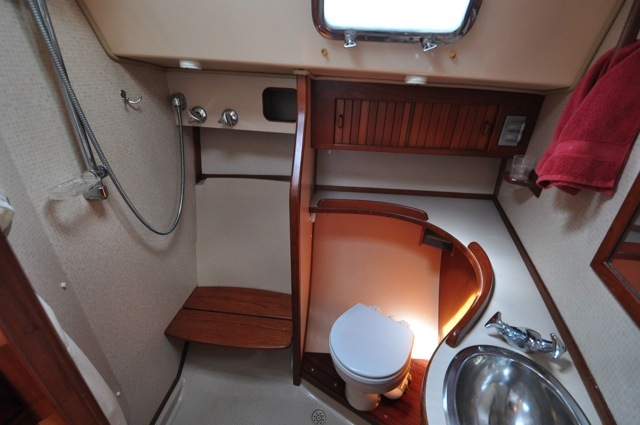 Headroom of 6'5" gives the vessel a wonderful roomy, light feeling. The folding dining table seats six easily, but is also folded and secured against the bulkhead to provide a roomy salon where you can walk around without squeezing by people. 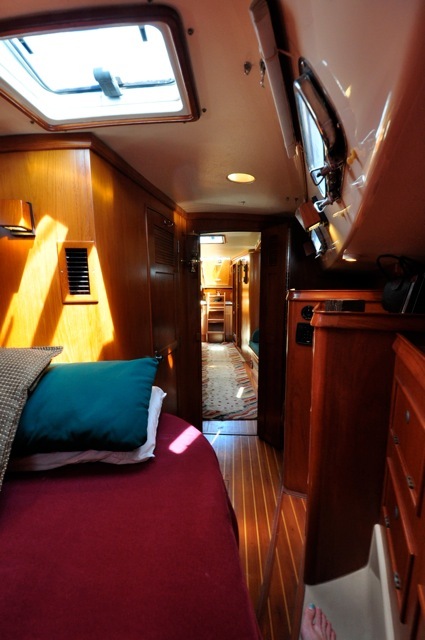 The starboard settee berth is a perfect sea berth and makes a double for guests. The port seating arrangement has two chairs with a table between, but it also makes a straight settee seaberth. Storage below and outboard of the settees is magnificent. Bookshelves and cabinets outboard port and starboard are very nice. The galley is a truly supream workspace! The ships office is a private nook on the port side. 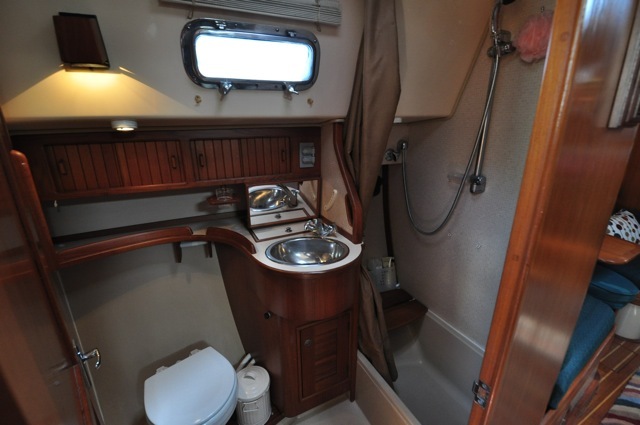 The owners aft stateroom is private and comfortable with it's own access to the large aft head which actually has a bath tub that is also a generous stall shower with the fold down teak seat. Aft head has tub and shower! Beautiful galley makes cooking and dining a wonderful experience. All the amenities, lots of counter space, open and airy, access to the cockpit, loads of storage. A wonderful "kitchen". With more water than you know what to do with, it is easy to enjoy the kitchen and the showers! Aft head with tub and shower! This yacht has practically everything you could need for round-the-world passagemaking. Her most recent additions include two new (2011) Kohler Solar panels professionally mounted over top of the large cockpit bimini. 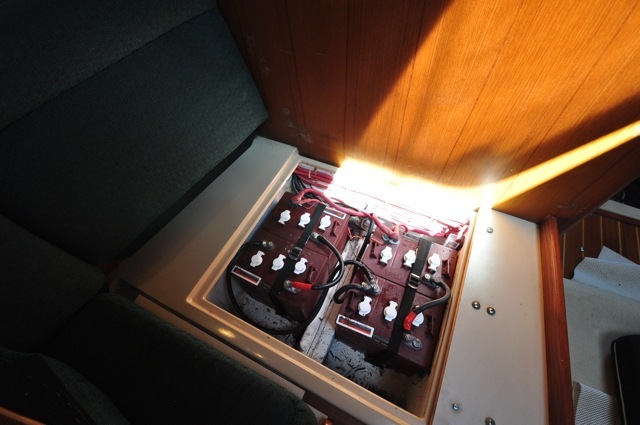 They're completely out of the way and bring in ample power to run basic systems during a day of sailing. She also jut got (2011) an AIR Breeze wind generator to further detach you from engine driven power generation. Between the solar, wind, main engine, and Fischer Panda genset, you can easily satisfy your power needs across entire oceans. As with so many boaters, plans change. These owners bought the boat for some serious voyaging. After purchase and thoughtful updating, an unexpected but awesome business opportunity arose that kept them far from their boat for too much time. Sophyra was built and outfitted for a voyage her current owners just don't have time for right now. Island Packet has a wonderful formula for easy sail handling. 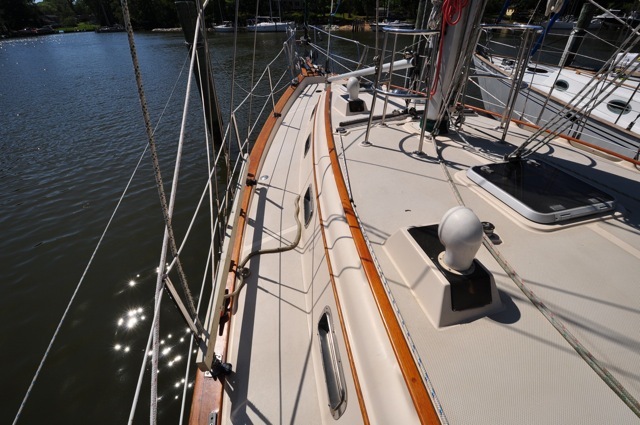 She's a true cutter offering an easliy managed sailplan with many options for all conditions. The aluminum mast is keel stepped and is easily intercoastal capable. The cutter rig includes a a self tending staysail on a furler to make it even easier to sail shorthanded. The total sail area is 1082 sq ft. giving the boat a sail area to displacement ratio of 19. The headsail is a 110% high cut furling yankee. The staysail is a 90% furling sail that is self tacking. The mainsail is a traditional mainsail system with five full battens and two reef points led aft to the cockpit and a beautiful Doyle stackpack. One electric winch makes it super easy to raise the mainsail. Everything works really well. She sails great, especially when the other boats go home you'll be happy and comfortable. Again, whatever could be improved in the year of boat ownership was, without a mind to cost. Start with new sails, new running rigging, a new strong track, and ....! A The draft of only 5'7" makes this a great Bahamas boat. As you know, Island Packet builds a phenomenal boat by never compromising their core design principals that include a strong lain laid solid fiberglass hull. The interior construction uses a fiberglass component that is attached to a structural gridwork of floor timbers and bulkheads. The fiberglass work is excellent of triaxial roving and glass matt with the finest quality resins. The IP exclusive PolyCore system used in the deck is a modern core material that does not deteriorate. The gelcoat and stainless steel work are second to none. The boat is strong (beyond) and Island Packets typically stand up to years and years of service. There is a certain comfort in a strong boat! The build quality and comfort is a great formula. You'll spend your time in the cockpit due to the managed sail plan and everything on furlers. The cockpit is very comfortable and inviting, large enough for guests. With the beautiful dodger and bimini. Sophyra is complete with a beautiful Yanmar 62 hp engine with low hours, AC/Heat, Invertor, Propane, and ample batteries for a comfy cruising lifestyle. Nicely equipped with everything you need to get there and enjoy the Bahamas! 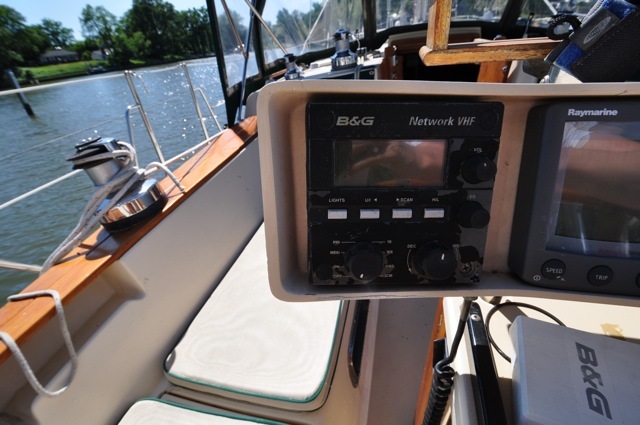 Radar, GPS plotter, SSB, VHF radio, and wind, speed, and depth. Nice compact nav station provides a ships office below decks.